Are you a qualified individual looking for a job as a certified surgical technologist? Here at Horizon Healthcare Staffing, we can offer candidates many CST jobs in surgical centers and hospitals located all throughout New York. Most of our job openings and opportunities are located in Brooklyn, the Bronx, Queens and Manhattan. There are two different types of certified surgical technologists. You can either be a scrub surgical technologist or a circulating surgical technologist. The scrub surgical technologist handles the instruments, supplies, and equipment necessary during the surgical procedure. The CST has an understanding of the procedure being performed and anticipates the needs of the surgeon. The surgical technologist assisting in circulating obtains additional instruments, supplies, and equipment necessary while the surgical procedure is in progress. The circulating surgical tech monitors conditions in the operating room and constantly assesses the needs of the patient and surgical team. Much of technicians and technologists’ time is spent on their feet and surgeries may take hours to complete. Initial certification as a Certified Surgical Technologist (CST) in New York is based upon satisfactory performance on the national certifying examination following completion of an accredited program in surgical technology. CSTs maintain their certification by earning 60 hours of approved continuing education in a four-year period or by successfully retaking the certifying examination at the conclusion of the four-year period. 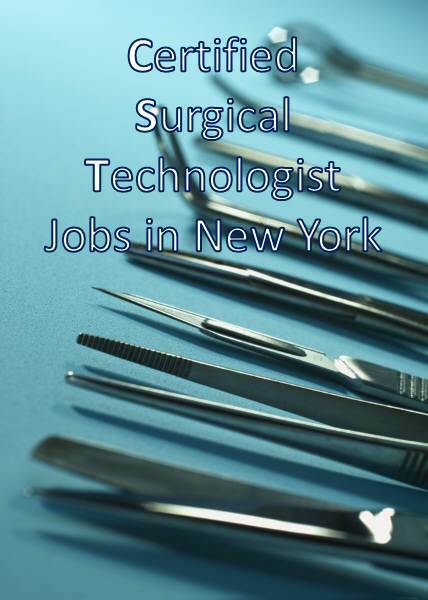 If you are a Certified Surgical Tech (CST), and are seeking a job opportunity, click on one of the New York jobs below. This is where we normally have open opportunities in surgical centers or hospitals. Once you apply, one of our recruiters will contact you to see if you are a fit for the position.